We bought Moon Dawg when he was 4 months old from a family that was moving to another town. 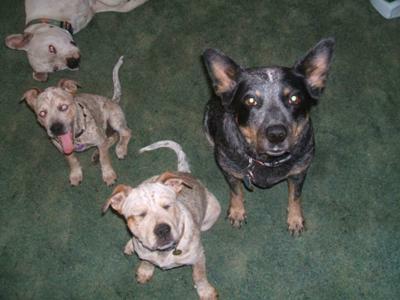 He joined our female blue heeler Billie Girl. Moon Dawg is a complete clown and a GREAT daddy! He became a daddy to 2 males and 5 females on Feb. 15th 2010. We have two of the puppies, 1 male (Moon Junior) and the female runt (Camouflage). His most endearing quality is his awareness of his surroundings. He is always aware of his surroundings in the way that he will always let us know if someone is in our driveway or if our neighbors are out. We love to go to the local lake and go swimming. Moon even got Billie girl in the lake to swim and she really doesn't like water but they love the lake.